The swim comprises of 1 lap of 750 m, beginning and ending in Quay 6. The cycle comprises of one lap of 4.8 km followed by 4 laps of 3.8 km. The cycle will start at Transition 1, Quay 6, V&A Waterfront. Out of transition and left into Breakwater Boulevard, turning right at the Granger Bay Boulevard roundabout onto Beach Road. Cycle along Beach Road until you get to Turning Point 1 before the Moullie Point lighthouse, returning back a long Beach Road and a right turn onto Fritz Sonnenburg Road. 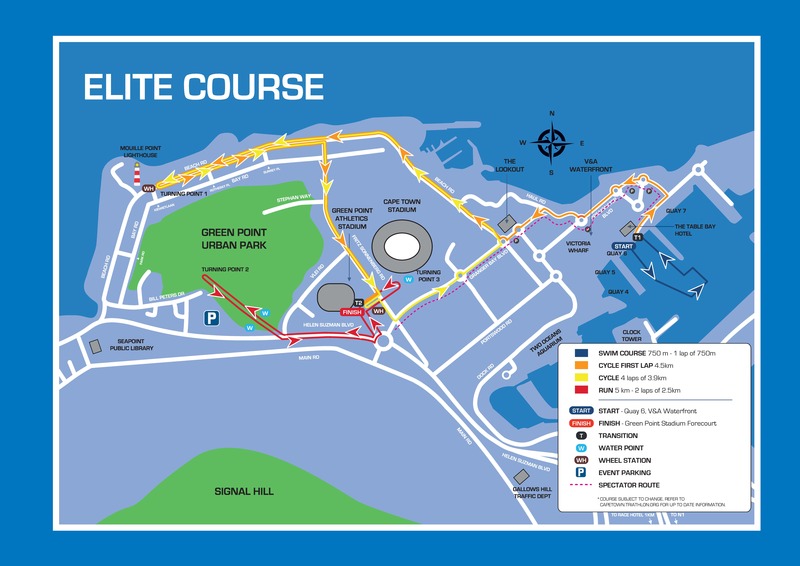 From this point follow the same routes as before back to the Stadium Forecourt for completion of Lap 1(which 4,8km). On completion of a further 4 laps of 3.8 km, you will enter Transition 2 (on the Stadium Forecourt in front of the grand stand) where you will start your run. The run comprises of 2 laps of 2.5 km ending on the Stadium Forecourt. The run starts at Transition 2, exiting the Stadium forecourt, down to the city cycle path and right across Vlei Road and into the Green Point Urban Park. Upon reaching Turning Point 2, you will return on the same course in the park, to exit park down the cycle path just before the underpass. Here you turn left and up the forecourt paved area At the top of the paved area you turn right and head down across Fritz Sonneburg Road alongside the Soccer Stadium to the turning Point 3. Left around the cone and back along the same route and as you cross Fritz Sonneburg Road you veer slightly right and down back through Transition 2 and the grand stands. Upon completion of 2 laps, you will do a final sprint just past the Transition 2 to reach the finish line. The LOC will provide free transportation for the Elite Athletes and their Team Officials from the airport to the hotel and back to the airport. This service must be booked by email: Manue@worldsport.co.za. This airport to hotel service will be available from Monday 6th February to Friday 10th February. It was the opening race of the 2017 ITU World Cup season and it could not have got better for the locals. Murray won in 51 minutes and 33 seconds followed by Schoeman on his heels 8 seconds later and Sullwald in 51.56.